Flood buckets collected at the 2018 Arkansas Ingathering were shipped to UMCOR’s Sager Brown warehouse for distribution when needed. A crisis can happen anytime, anywhere. Planning before a crisis, response during and recovery after are all critical stages to lessen the severity and longevity of damage that may occur, whether structural, physical or emotional. The Arkansas Conference has key personnel and guidelines in place that allow for timely and experienced assistance to victims. Staying informed of disaster response resources and information is essential for pastors and church leaders to be able to serve their community or their neighbors in a time of need. The mission of the Early Response Team is to provide a caring Christian presence in the aftermath of a disaster. Teams operate under very specific guidelines that enable a team to be productive and caring while causing no further harm or being a burden to the affected community. Early Response Teams respond, after emergency personnel, to disasters such as fires, hurricanes, tornadoes and flooding. They help families with cleanup, prevention of more damage to homes, and clean out of homes. One-day training must be completed to participate in this type of response. Classes are taught by United Methodist Committee on Relief (UMCOR) trainers from the conference. Team members are given ID badges as evidence of training. Spiritual Care Teams are faith-based, ongoing teams that provide spiritual and emotional care following disasters. Working closely with the Conference Disaster Response Committee, the Care Team helps disaster survivors connect with the spiritual, emotional and basic life resources within themselves and their communities. The conference provides the required training for this specialized ministry through UMCOR. Churches have the opportunity to open their doors in a time of disaster by setting up a shelter, providing meals, serving as a relief supply distribution center, or addressing other community needs. “Connecting Neighbors” is training geared toward guiding local churches in preparing for and responding to disasters in their own communities and beyond. Once Early Response Teams have completed their work, long-term volunteers may begin serving in a disaster affected area. These teams come in to begin the repair and rebuilding process. Through the Conference United Methodist Volunteers in Mission, mission teams help rebuild the homes and lives of disaster survivors. UMCOR’s model for disaster case management is a holistic approach that addresses the whole person: emotionally, spiritually and physically. Case managers work hand in hand with survivors to understand their situation, help them develop a plan, and connect them to recovery resources. Basic Case Management Training prepares caring people to help vulnerable individuals and families “adjust to their new normal” after a devastating disaster. All individuals and churches may respond to disasters by supporting UMCOR Sager Brown, the United Methodist Church’s distribution center for supplies to those in need, located in Baldwin, La. 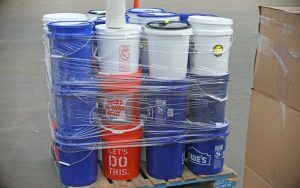 Support can be special offerings, hands-on volunteers to assemble disaster kits or do other work at the depot. For more information visit www.sagerbrown.org.